"Investors are having trouble knowing what to do in the current economic environment. Our goal is to provide the guidance needed to make sense of it all." 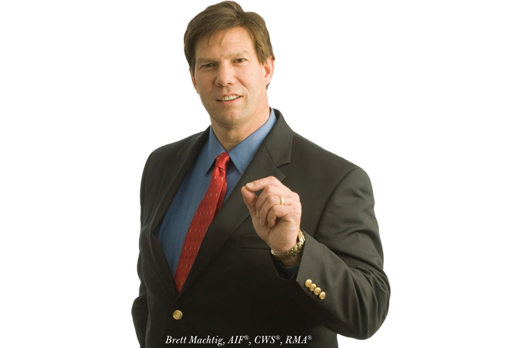 So says Investment Advisor Brett Machtig, AIF®, CWS®, RMA®, founding partner of The Capital Advisory Group Advisory Services, LLC (CAGAS)— Machtig is dedicated to helping high-net-worth investors navigate their top five greatest concerns. 1. Estate Planning – Most clients leave their fortunes to their children, but many are woefully unprepared for the ravages of divorce or creditors. The Capital Advisory Group Advisory Services (CAGAS) provides innovative solutions for estate planning shortfalls within wills, trusts, partnerships, durable powers of attorney and living wills. 2. Business Planning – Successful businesses need help when setting up succession plans, dealing with partners or preparing a business for sale. CAG identifies clients’ best options and pinpoints weaknesses of existing plans. 3. Benchmarking – High fees hurt returns. CAGAS benchmarks client fees to compare them to industry standards. All prospective clients with $1 million or more in assets can request a free benchmark of their current holdings, courtesy of one of the firm’s managing partners. 4. Economy – For the past three decades, the Federal Reserve has reduced rates during financial downturns. Our dollar has been diluted at record rates since 2009. How will the looming rise in interest rates impact investments? CAGAS helps clients capitalize on what- ever comes next. 5. Taxation – To solve their tax short- falls, states are shifting tax brackets and widening the range of taxable business assets. CAGAS works to improve clients’ tax position by proactively working with clients and tax professionals. Neither Capital Advisory Group Advisory Services nor United Planners Financial Service provide tax or legal advice. We work with you and your legal counsel to assist you with your estate plan.